Even though my husband dislikes coconut, I thought I’d give this a try, and we were both glad that I did. The custard and the whipped cream are fantastic, with a subtle rum-like-but-not-boozy-at-all flavor. My husband LOVED the whipped cream on this, did not like the coconut texture but really liked the custard, and brightened up considerably when I told him that I’d make it again. WITH BANANAS instead of coconut. Fantastic recipe, even though I forgot to add the bits of butter to the custard, and it was a bit too stiff as a result. Definitely on the repeat list! This was such a wonderful tart. Did you use a pie crust or the tart crust? Yum, your whipped cream looks awesome and that’s definitely my favorite part of this tart 🙂 Glad it was a hit for you guys! I will have to remember the banana bit…my hubby would love it that way since he wasn’t crazy about it as a coconut tart. More for me! 🙂 Yours looks great! I used the pie crust, ’cause that’s what I had sitting in my freezer! I’m with you – bring on the bananas! 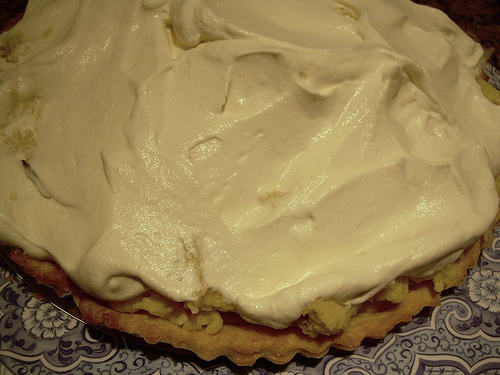 I found I like banana cream pie even better when I lightly tossed the bananas in lime juice first. Love coconut. Wonder if you could make a coconut/banana tart. HUMMM!!!! Great suggestion – I will remember the lime juice when I make it! My daughter felt the same way as your husband. She liked the tart, but couldn’t get past the texture of the coconut in the custard. So, next time, I will make it coconut flavor, but without the added texture. Bananas sound like a perfect substitute.